In addition to managing your colonists' needs, you can also manage their relationships. Sometimes you may need to "encourage" operatives to become friends or even "special friends," either to meet a mission goal or to make things run more smoothly in the work environment. For example, operatives who work together can satisfy their human contact need by engaging in small talk (below), but this only works if they're friends, not enemies. Each operative starts out with a certain basic level of liking for every other operative. Some are best friends (like Hoshi and Kita) some are enemies (like Stig and Tami). Over time, if operatives don't interact, their relationships will deteriorate. So operatives who started out as friends can become enemies. Sometimes operatives choose to interact without your intervention, but most often you will need to help them build friendships and romances. To see how well two operatives get along, select one of them and then click on the red heart icon to the right of the portrait in their colonist panel. Here we're looking at Babette's relationships. (Click the image to the left to see a larger version.) When she steps off the shuttle on her first mission, Babette has three friends (Mr. Zhang, Nailer and Bhoomi) and six enemies (Venus, Stig, Slim, Hoshi, Kita and Greg). She has no romantic interest or "special friend" (empty space in the area with the heart). The red or green colored bars below the colonists' faces show the state of their relationship with the selected colonist. Select one operative and then click on another. 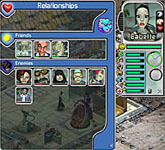 A social interaction menu appears above that operative's head (as shown in the screenshot to the left, where Babette is selected and then Greg is clicked). You can then select one of three options: friendship, small talk or romance. Friendship (the chairs icon) will send the two operatives to a social area to talk things over. Doing this raises their social interaction bar and improves the operatives' relationship. It can even turn enemies into friends, though you may have to repeat the process a few times for that to happen. Let's say we have two operatives who don't get along that well and we want them to become friends and ultimately fall in love. In the Civilian mission Fairway, that's exactly what we must do with Babette and Greg. So we'll use that particular goal as an example. The first thing you'll want to do is send them to a social area to work out their differences. Follow the steps for Friendship under Basics of Social Interaction, above. Once they have become friends, you can move on to dating. Select one or the other colonist. Then select Romance from the Social Interaction Menu. Moving the cursor over the different dating optionsdinner, a drink, dancing, workout, sauna and Jacuzzishows the percent chance the operative being asked will accept. You must have the necessary objects (restaurant, bar, disco, etc.) in your base; otherwise those date options will not be available. In this screenshot Babette is selected. She's about to ask Greg to join her in the Jacuzzi. The chance he'll accept is 100%. If you click the Jacuzzi icon, she would ask him for the date, he'd accept and they'd head off for a soak. Notice that the chances of a success vary depending on the type of date, who's asking and who is being asked. For example, this relationship, the chances are always higher when hot, young Babette asks desperate old bachelor Greg, rather than the other way around. If you continue building the operatives' relationship with the social area, the chance for successful dates increases across the board. The final option on the romance menu is, "Will you be mine?" (hearts and flowers icon). Clicking it makes one colonist to ask the other to be his or her boyfriend/girlfriend. Hovering the cursor over the will-you-be-mine icon shows the chance of the other colonist accepting. Keep in mind that the chances of one colonist saying yes when the other pops the question are just that, chances. You can start asking, "Will you be mine?" early on, even when chances are low. You (and they) might get lucky. If it doesn't work out at first, keep talking and dating and eventually it will. A few more minor notes on romance: First, the work shift can cut into available time for romance. So, if the mission allows, delete the colonists' jobs (in the colonist panel) and have them concentrate on the romance goal. Once it is met, they can go back to work. Second, you don't need to actually follow through on a particular date for it to count toward relationship building. As long as the date is accepted, the option is checked off and the relationship is strengthened. If you want, you can then send the operatives off in different directions or immediately have them try a different type of date.